Shion 2.1.0b4 is now available. Initial support for sprinkler devices. Fixes for executing lengthy AppleScripts. 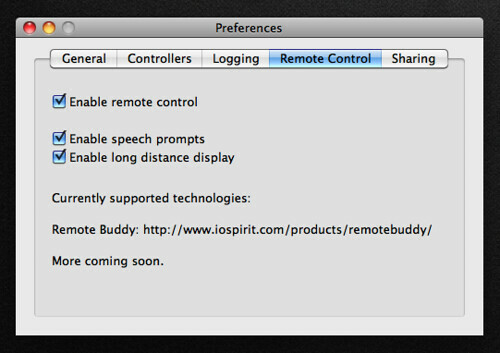 Shion now supports remote control (again) using Remote Buddy from IOSPIRIT. 1. You install Remote Buddy and set it up to use a remote control. You can use the bundled Apple Remote or any other supported device. 2. Install the Shion behavior available here. 3. 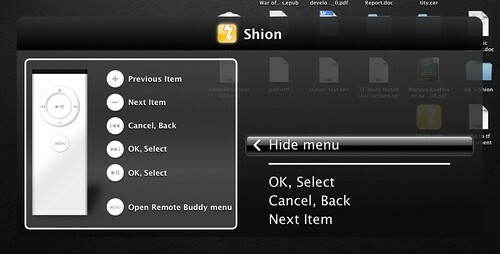 Select Shion from the Remote Buddy menu (as seen above), and have fun controlling your installation from across the room. I built a custom interface for this feature that assumes that you are not sitting at your computer for control. The interface Shion provides in this mode is very similar to a phone tree. You can use the remote control to cycle through available devices and relevant actions. For example, on startup, you’ll be presented with a device. You can use the next and previous buttons to select another device. When you have selected a particular device, clicking OK will ask you which action you want to execute (activate, deactivate, brighten, dim, etc.). Click OK to execute the action and return to the device list using the back button. I’ve been using this interface for the past couple of months and it’s really worked well for me. However, be advised that this feature is still in its early phases, so let me know if you run into glitches. As this matures, I hope to use the same underlying technology to implement similar alternative interfaces such as phone menus that allow you to call into Shion using any regular telephone and control your environment that way. At the moment, toggle and continuous devices are the only devices controllable from this interface. In a future release, I’ll include others like the thermostats and sprinklers. Wait. Did you say “sprinklers”? Indeed I did. 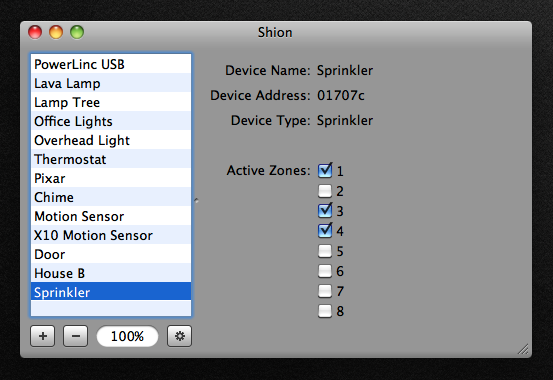 This release of Shion includes very early and very basic for sprinkler controller devices such as the EZFlora. By early and basic, I mean that there is now an interface to toggle the zones, but little else. I only added support for this earlier today, and I need your help testing it. With my unit, I found that I was able to turn zones on, but I was unable to turn them off, unless I removed power from the device. My review of the relevant network traffic showed that the right messages were being sent to the unit, but the “off” commands were being ignored. I tried to link my unit using X10 as an alternative testing method, but this failed as well. At this point, I’m beginning to suspect that I have a bum unit, hence my request for your help. If you have an EZFlora (or EZRain) sprinkler controller and would set it up in Shion, I would appreciate hearing whether you are experiencing the same problems. In the meantime, I’ll continue to investigate my problems and possibly replace my unit. Once we get this minor issue resolved, I’ll complete my implementation of the services for the device, including access from AppleScript and support for including the device in snapshots. This release also includes a handful of bug fixes, including one that truncated the execution of long (in a temporal sense) AppleScripts.